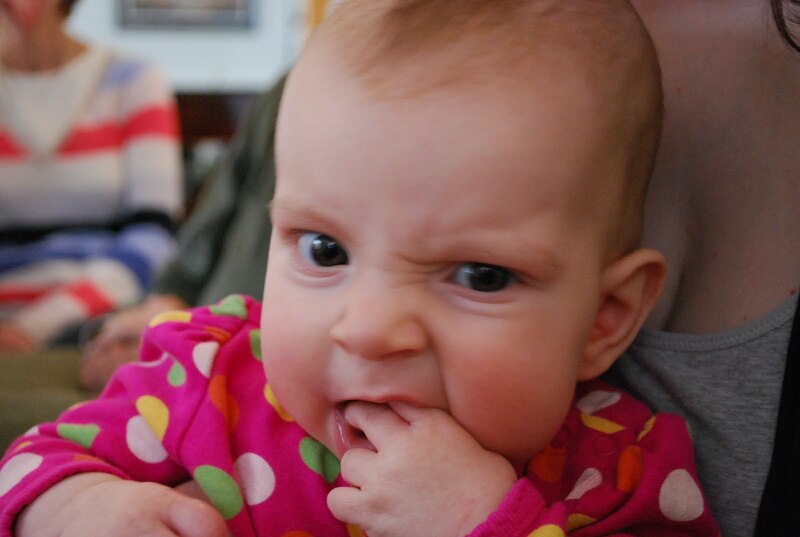 I'm beginning to realize that my days of blogging two or three times a week have come to an end, at least for the forseeable future. These days, my knitting time is relegated to about 30-40 minutes during my lunch break, and my crafty time in the evening is an hour at my wheel after Rainbow goes to sleep, if I'm lucky. 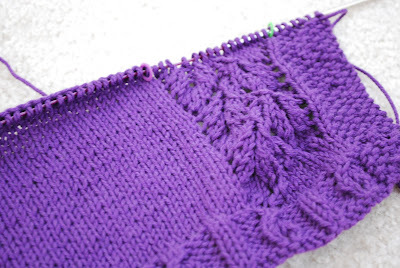 Because my time with yarn and needles has been so limited, I've been working on things that are interesting -- I just don't want to spend my limited knitting time working on stockinette or garter stitch these days. 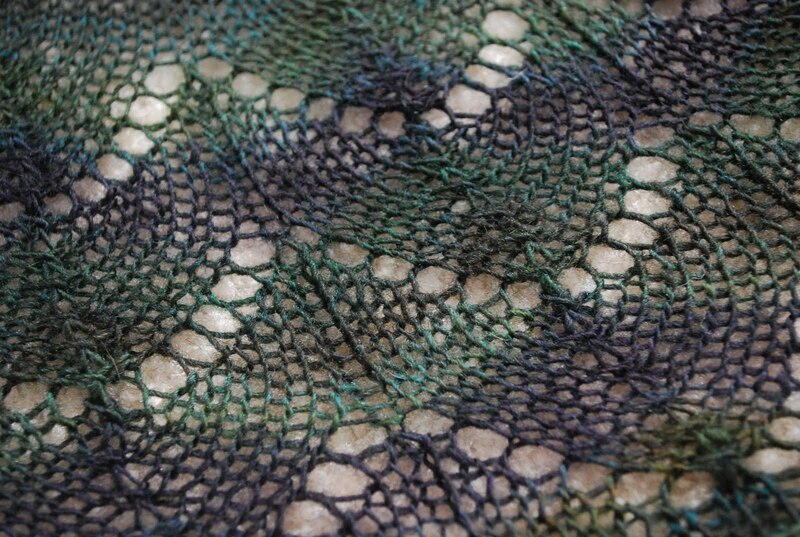 Specifically, I've been knitting lace. I've been on a real shawlette kick lately. My most recent? Another viral pattern -- Traveling Woman. 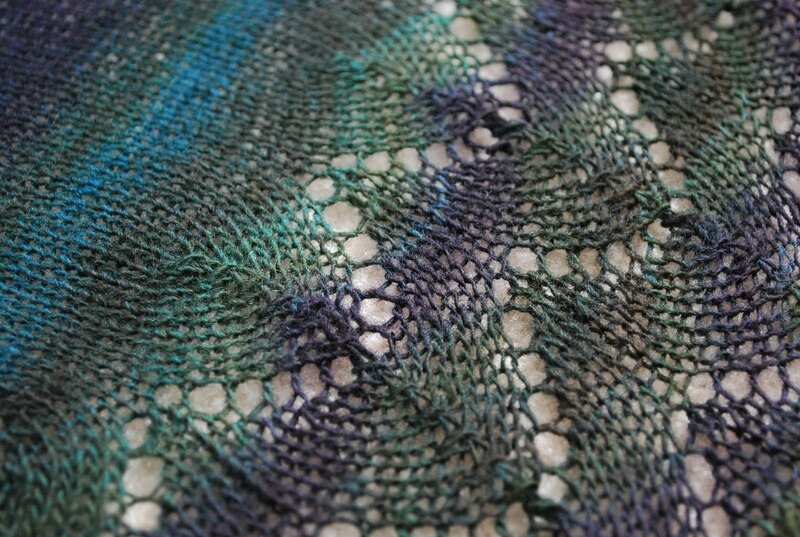 Although these detail shots don't quite show the colors accurately, they do give you a sense of the really subtle -- but really pretty -- color variation in the yarn. All the credit goes to Kristin of All Spun Up for that. I thought the subtlety would be perfect for this pattern. 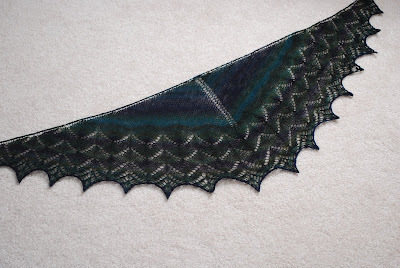 If you look at the completed shawls on Ravelry, you'll notice that most are blocked with a semicircular border or gentle points. I, however, find it practically impossible to block anything gently, so my Traveling Woman has pretty definite points. 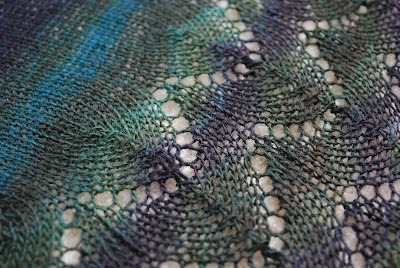 The lace motifs don't seem to have suffered by my showing this shawl no mercy, though, so I'd say it all worked out in the end. 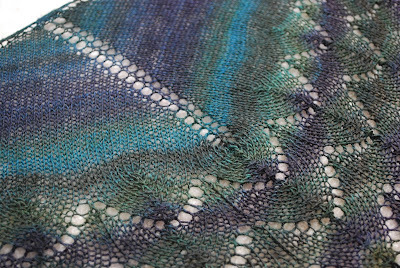 After finishing this shawl I immediately cast on for another -- Haruni -- in some Dream in Color Smooshy that'd been in my stash for maybe a year. I hope I'll have more time to work on it so that I can show it to you soon. I'm also working on a little something for Rainbow that I started several weeks ago when we were driving up to Michigan for my brother's graduation. 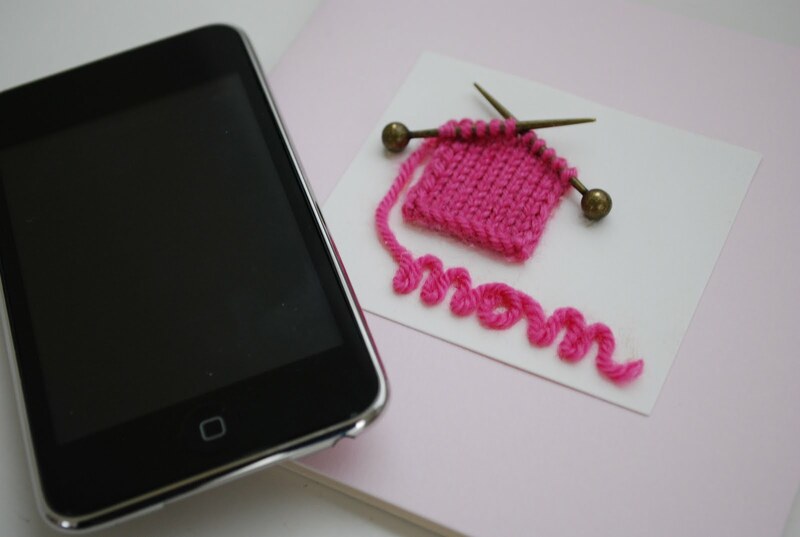 I've made this pattern before, but always for gifts, so it's nice to finally be able to knit it for my own child. It's the (in)famous Pea Pod cardigan. If the yarn looks familiar, it's because it's Cotton Fleece left over from my Mommy Snug. Rather appropriate, I think, that I'm using the same yarn for mommy and daughter sweaters -- both by the same designer, no less! Ever have one of those months that just gets away from you? That was April for me; it seems like it was over just as soon as it began. The beginning of May wasn't any slower, either. Last weekend, we took Rainbow on her first road trip to go to my little brother's college graduation. Then, as soon as we got home, the Mister left on a two-day business trip, which meant it was just us girls at home (and I crawled into bed just as soon as the wee one went to bed). This past weekend, we were finally able to catch up on errands and chores (including, if my count is correct, five loads of laundry), so this is the first opportunity I've had to get to my computer in a while. 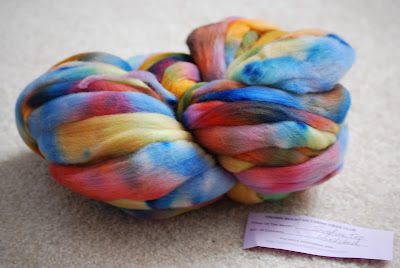 Tonight, you get what I intended to post yesterday for Spinning Sunday, the latest yarn off my wheel, which took pretty much the whole month of April to spin. I have mixed feelings about this. It all started with the fiber, April's shipment from the Crown Mountain Farms fiber club, 4 ounces of Wensleydale in a colorway called Sunrise Over Kangchenjunga. If you've been reading this blog for a while, you'll know why I was less than enthused when I opened the package: Orange is my least favorite color. Still, I hoped that once it was spun up, I might like it more. 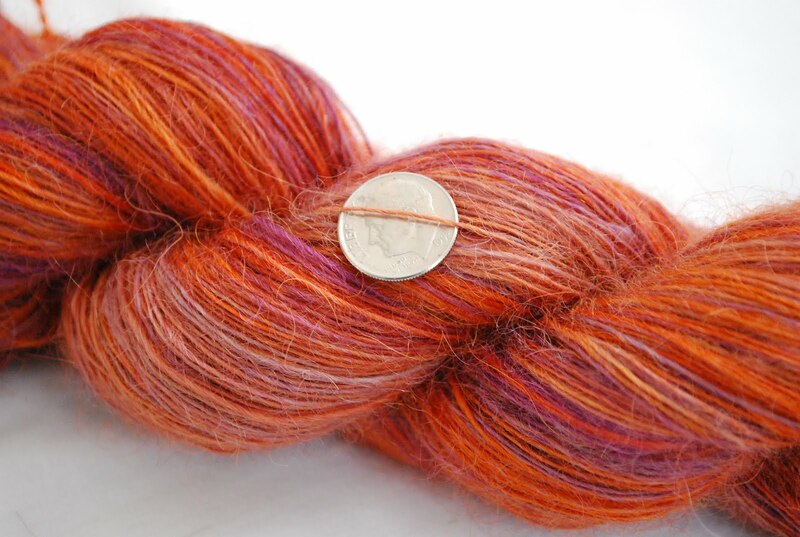 After all, some of the speedier spinners on the CMF Ravelry board had already posted their finished yarns, and some turned out more of a peachy shade when spun. 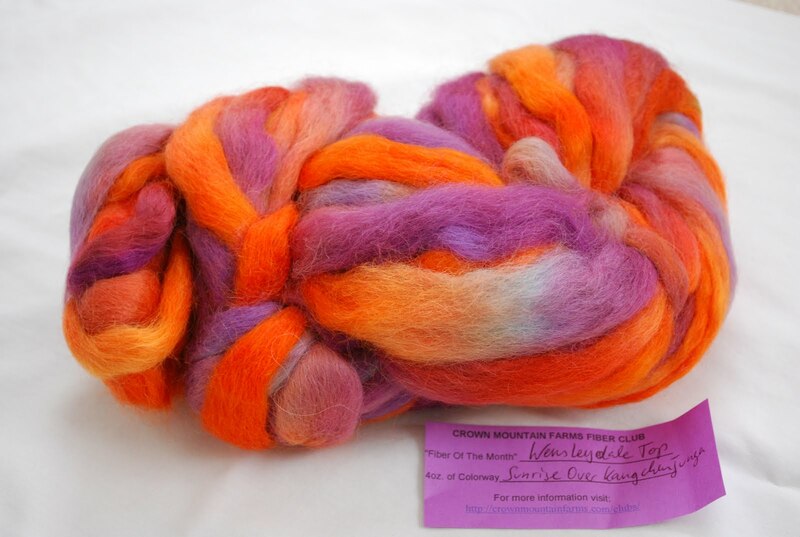 As you can see, the orange didn't soften or lighten at all in the spinning process. 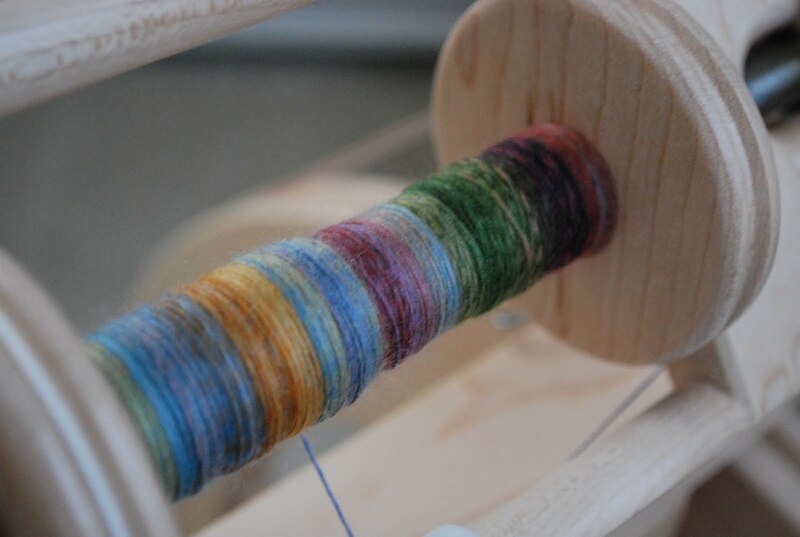 I also didn't particularly enjoy the process of spinning it -- the fiber felt rather like human hair to me. And while I'm pleased with the final yardage, I can't see myself ever knitting with this yarn. I don't regret spinning it, because the reason I joined the fiber club was to get outside my comfort zone and spin new-to-me fibers, but this skein very well might be listed for sale in the future. I was much more excited about the May fiber club shipment, which promptly went on the wheel as soon as the Wensleydale came off. This is targhee in a colorway called Woodstock (it does rather look like tie-dye, doesn't it?). I'm spinning it fine and tight for a traditional three-ply sock yarn.